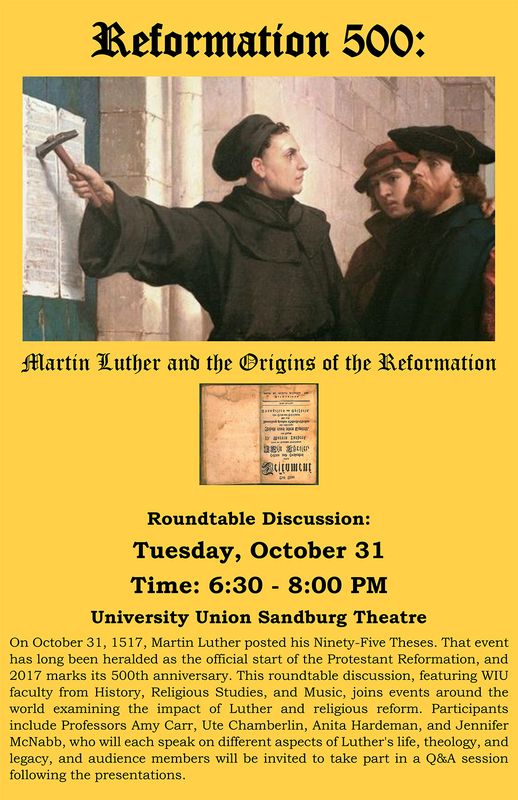 MACOMB, IL -- The Western Illinois University Department of History will sponsor a faculty panel discussion, "Reformation 500," to commemorate the 500th anniversary of the initiation of the Reformation from 6:30-8 p.m. Tuesday, Oct. 31 in the University Union Sandburg Theatre. On Oct. 31, 1517, Martin Luther posted his Ninety-Five Thesis, an event which has long been heralded as the official start of the Protestant Reformation. The roundtable discussion will feature WIU faculty from the departments of history, religious studies and music. "With this program commemorating the events of 1517, WIU joins other academic, religious and cultural institutions throughout the world in marking the 500th anniversary of the Reformation," said Jennifer McNabb, chair of the WIU Department of History and "Reformation 500" panelist. "This historical anniversary offers valuable opportunities to reflect on Luther's life and the legacy of religious change, both in the sixteenth century and in our own time." Other panelists include WIU professors Amy Carr, Ute Chamberlin and Anita Hardeman. "The 500th anniversary of the Protestant Reformation is rightly considered a commemoration rather than a celebration, for it marks a split in western Christianity that echoes to this day," said Carr. "That split was as much about emerging nationalism in Europe as it was about a theological challenge to the Catholic understanding of papal authority and scriptural interpretation. Today, the legacy of the Reformation is found in the proliferation of denominational and non-denominational churches. Oddly, while Lutherans have potlucks and sing Luther's hymns on Reformation Sunday, many non-Catholic Christians in the U.S. may be unaware that their churches--including evangelical and non-denominational churches--are part of the legacy of the Protestant Reformation, which is "only" 500 years old (only a quarter the length of the history of Christianity itself)." Carr said the 500th anniversary of the Reformation is a time to be more aware of the history of Protestant Christianity. "From Luther's initiating of public debates about church authority and the nature of salvation, to the 20th century ecumenical efforts that have led Catholics and Lutherans themselves to affirm a more shared understanding of their faith than could be acknowledged in the 16th century," she said. "Christians aware of Reformation history are asking: what reforms and renewal are needed in our day, in church and in society?" For more information about the panel discussion, email McNabb at JL-McNabb@wiu.edu.